Will my Frigid Forage seed still be good next year if I don’t get it all planted? Yes, absolutely. Our seed is fresh every year and if stored properly can easily be kept until the following year with little loss in germination. Place bags in a sealed plastic tub and keep them cool and dry. Is it a good idea to seed my fields heavy to get a really nice food plot? The answer is no. 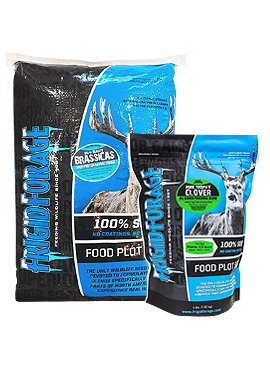 Our seeding rates are carefully calculated to get the maximum growth from your food plot. Seeding heavy will result in stunted and underdeveloped plants due to too many plants per square inch; this is especially true with annual blends such as Big N Beasty and Plot Screen. Not only will you be wasting money, you will not be happy with your food plot come hunting season. Do I need to fertilize? Yes, Plants are a living organism and they need nutrients in order to grow. The nutrients come from the soil and are dissolved in water and absorbed through a plant’s roots. The primary nutrients are nitrogen (N), phosphorus (P), and potassium (K). These are the three numbers you will see on a bag of fertilizer. These 3 major nutrients usually are lacking from the soil because plants use large amounts for their growth and survival. If you want to grow a successful plot you need to add these to your soil. Is it worth spending the money on a soil test? Yes. Fertilizer is expensive so you don’t want to waste it or use an incorrect blend of fertilizer for the type of plants in your food plot. Soil tests are inexpensive, a proper soil analysis performed at a lab typically costs less than a single bag of fertilizer. Your test will let you know your soil’s pH and exactly how much N-P-K you need to add to your soil for the type of plants you are growing. Why is my soils pH important? Soil pH is a measure of the acidity or alkalinity of the soil. Acidity is one of the most important soil properties that can affect the availability of nutrients and a proper soil test will let you know your soil’s pH. A low pH will make nutrients in the soil less available to the plants. Lime can be added to the soil to make it less sour (acid) and also supplies calcium and magnesium for plants to use. An Annual is a plant that performs their entire life cycle from seed to flower to seed during a single growing season. All stems, roots, and leaves of the plant die annually. At this point the dormant seed bridges the gap between one generation of the plants cycle to the next cycle. A Perennial is a plant that persists for many growing seasons. In most cases the top part of the plant dies each winter and then regrows the following spring from the same root system. Many perennials keep their leaves year round. Biennials require two years to complete their growing cycle. The first season of growth results in a small amount of leaves near the soil surface. The second growing season the stem elongation, flowering and seed formation occurs. Once this process has taken place the plant then dies off. Why not just buy my seed from the local mill? Know what you’re buying. All seeds are not created equal and you need to know the facts behind the seed being sold. Tags providing important information such as variety, germination, origin, purity, and test dates should be provided. At Frigid Forage we research all our seed and bring you the highest quality and freshest seed available. Remember the cost of the seed is often one of the least expensive parts of building a successful food plot. Fertilizer, herbicides, lime, and not to mention fuel are just some of the many expenses that can quickly add up when building a quality food plot. After all that hard work, it only makes sense to put the best seed blends you can buy for your hunting property in the ground. Don’t put all your eggs into one basket. Each seed and each variety of seed has its own unique characteristics and benefits. By planting a blend you can take advantage of these differences and provide your deer herd with forages that will thrive under your particular conditions. In other words, if some varieties struggle then others will flourish, increasing your chances for a successful plot. In addition, since different plants grow and mature at different rates, you lengthen the window that your plot will attract and hold deer. What is the best blend to try first? For perennials I would recommend the Wild Game Buffet. This perennial blend will last for years, and is easy to establish thanks to some of the annual nurse crops present that protect the clovers from overgrazing until their root systems become established. utilized all the way through February if you plant enough.